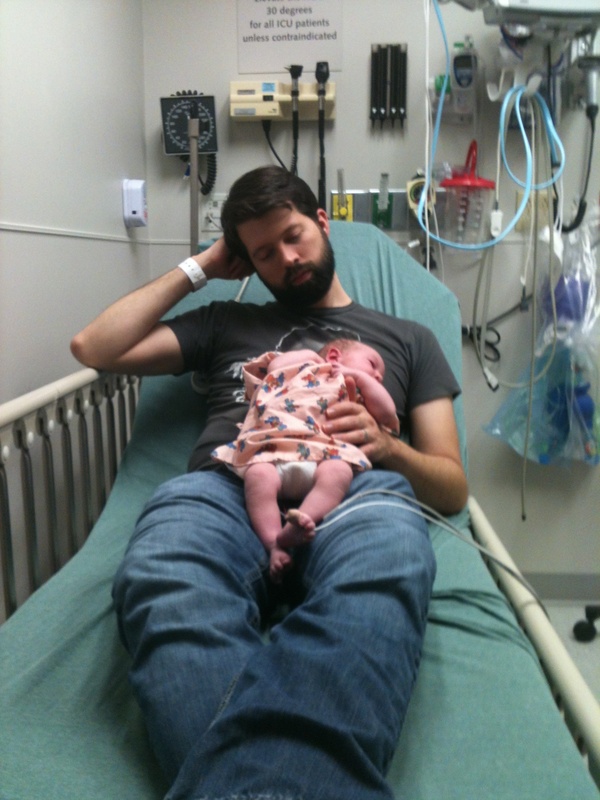 Yesterday we took our first ambulance ride and trip to the Emergency Room. 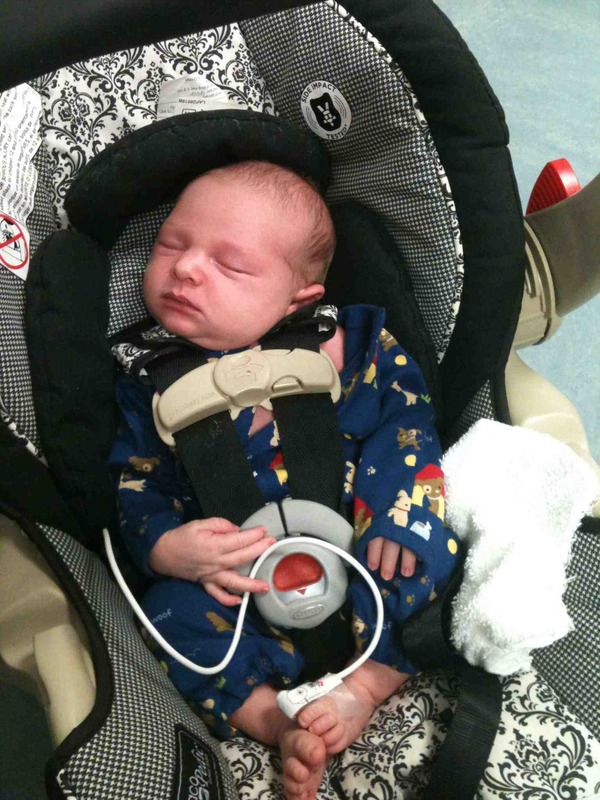 Baby Simon had some trouble breathing after choking on reflux and when an 8 day old has trouble breathing you call 911. He was sound asleep in my arms when he suddenly vomited a large amount all over himself and me. He got choked up on the reflux and even after Joe and I used the aspirator several time to help clear his airway he was still gasping for breath. He started to turn blue and that’s when we called 911. The EMS responded very quickly and when they arrived upon the scene they said he was struggling, looked blue and gave him oxygen. As soon as they gave him oxygen he perked right up. The wanted us to take him into the Pediatric ER to get him evaluated so we took a little ride in the ambulance to the hospital. We spent over 5 hours in the ER, they monitored him and did chest x-rays. By the way x-rays for babies are no fun to watch. 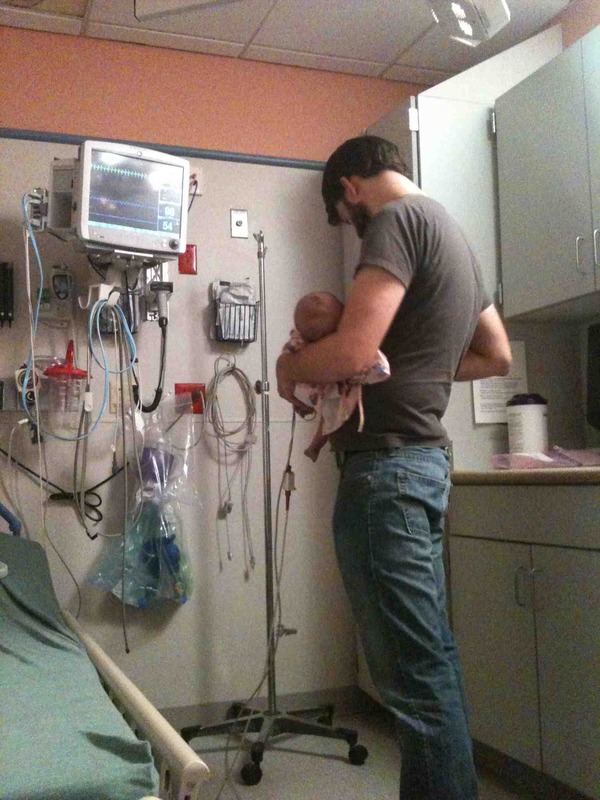 They said he had reflux and trouble breathing but it seemed to be a one-time incident and there was no larger problem. It was a relief to know nothing was seriously wrong with him but I also felt a little over dramatic over the whole thing. Then Joe reminded me that the breathing of a newborn baby is nothing to mess with and I was not being over dramatic. Better to be safe than sorry. I am so thankful that my parents live close by and were able to come over and watch the big boys so Joe could go with me and Simon. Hey, praying for your boys..hope they are feeling better! You made the right decision and didn’t over recact. I’m glad to hear that it’s nothing majorly wrong with him. Oh Jessica! How awful to hear about this!!! I am so glad that it was nothing sever or long lasting. I would have been so upset to see my newborn choking, struggling for breath and turning blue. I am so glad everything has worked out. Riley vomitted every evening for the first few weeks. We too thought it was reflux. The pediatrician even prescribed medication. However, it continued to happen. We finally realized that since it was happening every evening at just about the same exact time it had to be something I was eating. It turned out to be coffee. I switched to decaf and the problem went away too. It doesn’t sound like this is something that you’ve been struggling with but I thought I’d mention it. I hope you all are doing well and have recovered from this emergency stress! Wow that is crazy. It only happened that once and he hasn’t vomited since so hopefully it was just a one time deal. We are doing well now but I’m certainly more aware of what he’s doing at all times now. I am so glad he was fine. He has gorgeous features. Take care and enjoy him! !